Still plenty of snow on the last part of the hike. 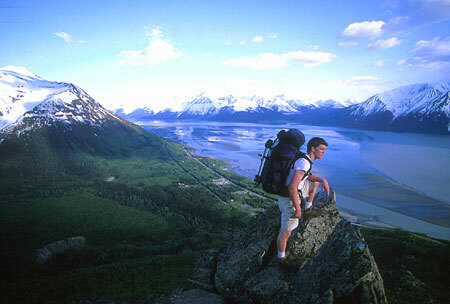 Above Craig Pope is seen looking out over the Turnagain Arm. Strenuous trail. Steep with some scrampling required. Well developed for the first 1.5 miles (2.4 km) to trail end above treeline. Elevation gain: 2500 ft (760 m) to trail end at ridge crest. Route continues along ridge crest. Exposed and windy. Good views of Turnagain Arm. Special features: First snowfree spring hike, first wildflowers. Views of Bore Tides when the tide shift is high.